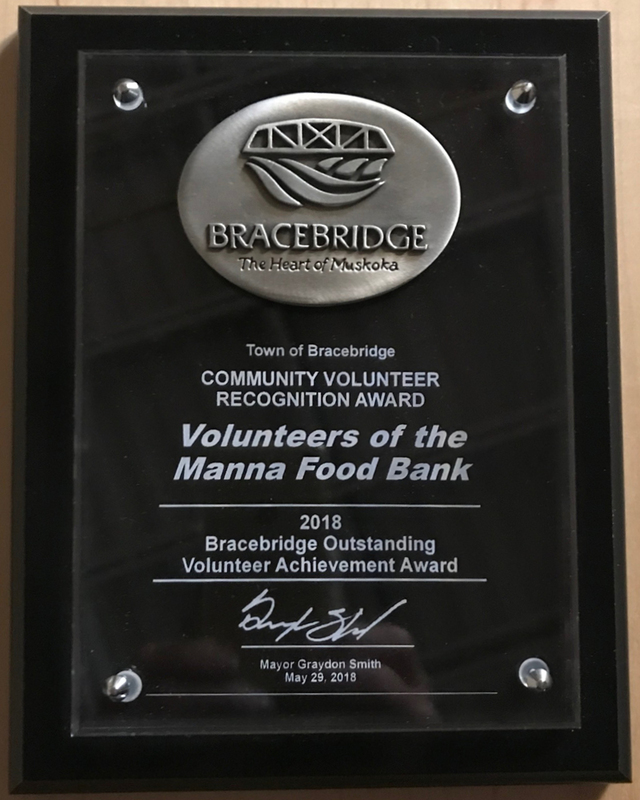 June 2, 2018 — Here is what the Town of Bracebridge had to say in presenting Manna’s 2018 Community Volunteer Recognition Award. Presented to the volunteers of the Manna Food Bank by the Town of Bracebridge on May 29, 2018. “The Bracebridge Outstanding Volunteer Achievement Award recognizes individuals and groups for outstanding volunteer contributions to their communities and to the Province. This year’s recipients are the volunteers of the Manna Food Bank. In 1983, a group of clergy from the Town of Bracebridge recognized the need to assist struggling local families. They formed a committee and began helping. By 1993, that need became so great that Manna Food Bank was incorporated. Since that time, the Manna Food Bank has fulfilled the ever increasing need. Nearly 100 volunteers offer their time and their service to provide food for over 600 families here in our community. Because the Manna Food Bank relies entirely on donations and the support from our community, every volunteer provides an invaluable service to ensure continued operation. Each volunteer is sensitive to the needs of every client and fully recognizes that all individuals leave their pride and dignity outside their doors before entering. They assist clients twice a week and ensure that all information remains confidential. Some of the volunteers have been with the organization since 1997 in a variety of roles, while over 20 individuals have served for 10 years or more. Unfortunately, we recognize the growing need of the services of a food bank here in Bracebridge and applaud all those who unselfishly serve that demand. Congratulations to all of you who donate your time and talent to Manna. This is for you! Learn more about becoming a Manna Volunteer and how to Donate. Learn more about how to Get Support.